HUANG Guowen is a Chair Professor of the Changjiang Programme selected by the Ministry of Education of P.R. China. He has been a professor of Functional Linguistics since 1996 at Sun Yat-sen University, P.R. China. He is now Dean of the College of Foreign Studies and Director of Centre for Ecolinguistics at South China Agricultural University, in Guangzhou, China. He was educated in Britain and received two PhD degrees from two British universities (1992: Applied Linguistics, Edinburgh; 1996, Functional Linguistics, Cardiff). He was a Fulbright Scholar in 2004-2005 at Stanford University. He serves as editor-in-chief of the Journal Foreign Languages in China (bimonthly) published by the Higher Education Press, China. He is also co-editor of the journal of Functional Linguistics (Springer) and co-editor of Journal of World Languages (Routledge). He publishes extensively both in China and abroad and serves/served as an editorial/advisory committee member for several journals, including Linguistics and the Human Sciences (Equinox), Language Sciences (Elsevier), Journal of Applied Linguistics (Equinox), and Social Semiotics (Carfax). He is also a member of the Editorial Board of the Monograph Series Discussions in Functional Approaches to Language (Equinox). His research interests include Systemic Functional Linguistics, Ecolinguistics, Discourse Analysis, Applied Linguistics and Translation Studies. Lise Fontaine is a Reader at Cardiff University (Wales). She lectures mainly on functional grammar, word meaning, corpus linguistics, and psycholinguistics. Her research interests include functional grammar theory and, more specifically, the study of referring expressions. She is the author of Analysing English Grammar: A systemic-functional introduction (Cambridge University Press, 2012) and co-author of Referring in Language: An integrated approach (Cambridge Univesity Press, forthcoming). She has also co-edited the following three volumes: Systemic Functional Linguistics: Exploring Choice (Cambridge University Press, 2013); Choice in Language: Applications in Text Analysis (Equinox, 2013) and Perspectives from Systemic Functional Linguistics: An Appliable Theory of Language (Routledge, 2018), The Oxford Companion to the English Language, 2nd ed. (Oxford University Press, 2018) and The Cambridge Handbook of Systemic Functional Linguistics (Cambridge University Press, in press). Edward McDonald gained his BA(Hons) from the University of Sydney in 1988, his MA from Peking University in 1992, and his PhD from Macquarie University in 1999, with theses on the clause and verbal group grammar of modern Chinese. He has taught linguistics, Chinese language, translation, semiotics, and music at universities in Australia, China, Singapore, and New Zealand. His recent research interests include the application of systemic functional theory to a range of languages including modern Chinese and Scottish Gaelic (Meaningful Arrangement: exploring the syntactic description of texts, Equinox 2008); Chinese language teaching and the hybrid concept of “sinophone” (Learning Chinese, Turning Chinese: challenges to becoming sinophone in a globalised world, Routledge 2011); and the comparative history of European and Chinese traditions of language scholarship (Grammar West to East: The investigation of linguistic meaning in European and Chinese traditions, Springer forthcoming). This volume brings together contributions to a key area of interest within the framework of systemic functional linguistics: the role of meaning in the lexicogrammar. A key figure in the debate on this role is Robin Fawcett who has long argued for a fully semantic lexicogrammar where the relevant systems are seen as representing ‘choices between meanings’. This volume, a festschrift in honour of Fawcett’s long-standing contribution to the field, raises important questions related to lexicogrammatical meaning within systemic functional linguistics by examining the meaning-form interface, lexicogrammatical meaning in theme and transitivity, as well as lexis, intonation and its role in computational models. Importantly, discussions in the volume also explore the relationship between alternative approaches to systemic functional lexicogrammar, notably between the Hallidayan model and the Cardiff Grammar model developed primarily by Robin Fawcett. Jonathan J. Webster is Professor, Department of Chinese, Translation and Linguistics, and Director, The Halliday Centre for Intelligent Applications of Language Studies at the City University of Hong Kong. He is also the General Editor of the Equinox journal Linguistics and the Human Sciences and a co-author, with M.A.K. Halliday, of Text Linguistics, published by Equinox in 2014. 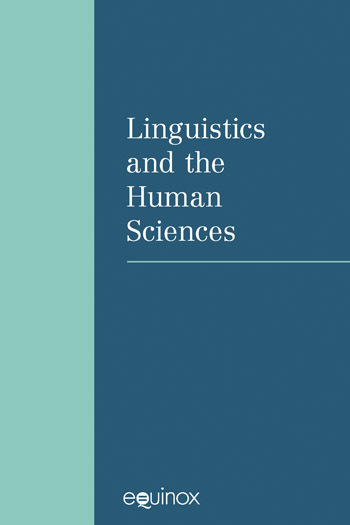 This volume brings together contributions to a key area of interest within the framework of systemic functional linguistics and this concerns the role of meaning in the lexicogrammar. A key figure in the debate on this role is Robin Fawcett who has long argued for a fully semantic lexicogrammar where the relevant systems are seen as representing ‘choices between meanings’. 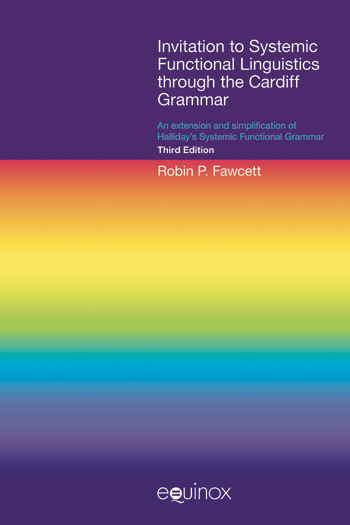 This volume, a festschrift in honour of Fawcett’s long-standing contribution to the field, raises important questions related to lexicogrammatical meaning within systemic functional linguistics by examining the meaning-form interface, lexicogrammatical meaning in theme and transitivity, as well as lexis, intonation and its role in computational models. Importantly, discussions in the volume also explore the relationship between alternative approaches to systemic functional lexicogrammar, notably between the Hallidayan model and the Cardiff Grammar model developed primarily by Robin Fawcett. Christopher Butler took a degree in biochemistry at Oxford University and taught biochemistry for several years, but then moved into linguistics, which he taught first at the University of Nottingham, then at what was what is now York St John University, where he held a Professorship in Linguistics. He took early retirement in 1998 to devote more time to research and writing. He holds an Honorary Professorship at Swansea University and is Visiting Professor at the University of Huddersfield. He has Honorary Doctorates from Ghent University and the Universidad de La Rioja. He has published several books and more than 80 articles, mostly on functional linguistics, computational and statistical techniques of language study, and corpus-based description of English and Spanish. His most significant book-length publications are Structure and Function: A Guide to Three Major Structural-Functional Theories (2 vols., Benjamins, 2003) and Exploring Functional-Cognitive Space (co-authored with Francisco Gonzálvez-García, Benjamins, 2014). Mick O’Donnell is a lecturer at the Universidad Autónoma de Madrid. From 1990 through 2001, he worked on various Text Generation projects, including Penman, ILEX and HiPS. He has also developed parsers for Systemic Grammar, funded by Fujitsu, and Language & Computing n.v. He is the author of UAM CorpusTool, software to support manual and automatic annotation of corpora, and earlier tools such as Systemic Coder and RSTTool. His current research interest focuses on exploring foreign language development through studying Learner Corpora. He is principal investigator of the Alegro project, developing an online system for English Grammar learning based on deep analysis of critical problems of Spanish learners. Víctor M. Castel has degrees in Linguistics from the University of Chicago (MA), and from Université Blaise Pascal (PhD), Clermont-Ferrand, France. He is Professor of Computational Linguistics in the Department of English, Faculty of Philosophy and Letters at the National University of Cuyo, Mendoza, Argentina. Castel retired in 2015 from the National Council of Scientific and Technical Research where he carried out research projects informed by Generative Grammar since 1985 and Systemic Functional Linguistics since 1998. His latest major contribution was a computational implementation of the Cardiff Grammar in its generation-oriented mode. David Schönthal is a Research Associate at Cardiff University, working with Professor A. Wray on linguistic perspectives on dementia. He has previously lectured at Cardiff University on functional grammar, lexicology, lexicography, and psycholinguistics. His main research interests include different approaches to grammar, such as functional grammar and construction grammar, the meaning of words, and the implementation of a multimethod approach. Specifically, he is interested in the English nominal group and the functions of the relator of, on which he completed his doctoral thesis in 2016. He is further passionate about pedagogy, andragogy, and the teaching of academic writing, and is offering writing and grammar support sessions to undergraduate and postgraduate students at Cardiff University. David is also co-author of Referring in Language: An integrated approach (Cambridge University Press, forthcoming) and co-editor of The Cambridge Handbook of Systemic Functional Linguistics (Cambridge University Press, in press). Kristin Davidse is professor of English Linguistics at the University of Leuven. She is also an alumna of the University of Sydney, where she was introduced to Hallidayan Functional Linguistics. Halliday supervised her Ph.D. in Linguistics on Categories of Experiential Grammar (1991). Her main research interest is the description of English grammar from a functional perspective. In the area of clause grammar, she has published on such topics as transitive – intransitive versus lexically ergative clauses, as well as middle, existential, copular and ditransitive constructions. In addition, she has dealt with it-and there-clefts and clauses containing fact projection. She has also published on various processes of change such as grammaticalization, deictification and intersubjectification in the English nominal group, as well as on the structure and functions of the nominal group per se. She was one of the founding editors of the journal Functions of Language. HE Wei is Professor of Linguistics, Deputy Director of the National Research Centre for Foreign Language Education, and Deputy Director of the National Research Centre for State Language Capacity at Beijing Foreign Studies University. She is author of over 160 publications and 80 presentations, including papers published in Linguistics, Language Sciences, Functions of Language, Australian Journal of Linguistics, Linguistics and the Human Sciences, Functional Linguistics, etc. She is chair of China Association of Ecolinguistics, SFL representative of International Ecolinguistics Association and deputy chair of China Association of Discourse Analysis. She has served as co-editor, column editor, associate editor, editorial advisory board member, or guest reviewer for over twenty international and national journals. Her areas of expertise include SFL, ecolinguistics, translation studies, and discourse analysis. She is particularly interested in exploring the interface between semantics and syntax from a functional point of view and in applying SFL to ecolinguistic studies. Margaret Berry, now retired, was Reader in English Language at the University of Nottingham, UK. She has published introductory books on systemic linguistics: An Introduction to Systemic Linguistics (Vol. 1): Structures and Systems (1975) Batsford and An Introduction to Systemic Linguistics (Vol. 2): Levels and Links (1977) Batsford. She has also published articles on a wide number of aspects of SFL, including context of situation, exchange structure, theme and rheme, given and new, register variation, and the application of SFL to the teaching of English. Her current research interests are in context of situation, exchange structure, theme and rheme and the written language of school children. She has lectured in China, Australia and Canada, as well as in Europe. She was instrumental in the organisation of a series of SFL workshops in Nottingham (1989-1992) which led to the formation of the European branch of the Systemic Functional Linguistics Association. Hiroshi Funamoto is associate professor in the Faculty of Economics and Management at Hokuriku University, Japan. His current research interests include the linguistic analysis of Japanese texts and developing a Systemic Functional Grammar of Japanese based on the Cardiff Model of language and its use. He is a contributor to the co-authored book, Language is Living: An Introduction to Systemic Functional Linguistics, the first compilation of original writings by Japanese scholars in SFL. He is responsible for the Japanese translation of Robin Fawcett’s Invitation to Systemic Functional Linguistics through the Cardiff Grammar, 3rd edition, which will be published by Kaitakusha (in press). As I review the list of insightful and substantial contributions to this volume by scholars who (like me!) admire, and have benefited from, Robin’s enormous multi-faceted contributions to linguistics in general and to our academic community in particular, I am of course struck by the variety of contributions, both in terms of geography and in terms of subject matter. This is entirely appropriate, reflecting Robin’s engagement with and support of scholars and students around the world.